In order to prevent information being overwritten in a process where more than one user is accessing the editor, HEFLO freezes editing so the first user can work on it and any other users can only view it. For the person who is allowed to edit the diagram, the message ‘You are the editor’ appears in the upper right corner. For those who later access the process, the message ‘You are not the editor’ will appear. If you’re not the publisher, HEFLO allows you to request permission to edit. 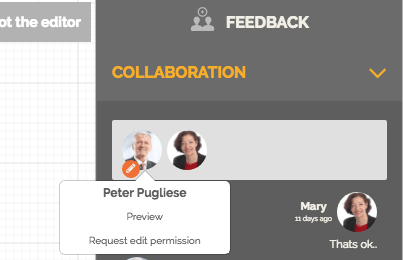 Click on ‘Feedback’ on the right and then place your cursor over the pencil icon, which indicates who the current editor is. You can request a ‘Preview’, so HEFLO will save and show you the updated process. Or, ‘Request edit permission’. In this case a message will be displayed for the current editor to accept or deny the edit transfer. 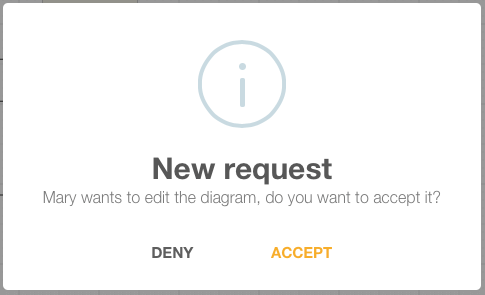 If the current editor accepts the request, then the pencil icon will be in your user image.